This run is highly limited and all copies of Xak and SOII are individually numbered. Every bundle of the first run includes one of our PCEWorks coins. If you’re just interested in playing the translated versions of Xak III and Startling Odyssey II, but you’re not into collectable packagings or great caravan shooting games, we have a special offer for you. Xak III The Eternal Recurrence is part of our first presentation for 2015. Definitely one of the most requested games, this deluxe edition of the game comes in a truly stunning looking and embossed deluxe packaging including a full color 16-page booklet in English language. Xak III is a classic action adventure, not unlike the original Ys series. The ability to form a party of up to three members and have party members act on their own gives the game a little more complexity though and a deeper RPG-touch. To accompany Xak III we’ve chosen Starting Odyssey II – a classic RPG. Another heavily requested title and just like Xak III unfortuntely unreleased in the West. The deluxe edition of SOII also comes in a gorgeous looking packaging. 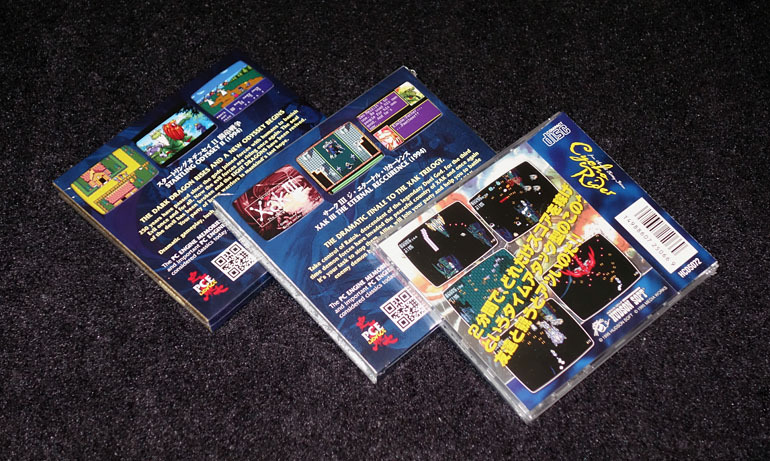 The game includes a full color 16-page booklet in English language, a map (with extensive item listings on the back) and even a translation of the manga included in the original japanese game manual. Cycho Rider completes our february presentation. Cycho Rider is a 2-minute caravan shooting game, very similar to Hudson’s entries to the Star Soldier series or Naxat’s contributions to the festival shoot’em up series (Nexzr or Alzadick). Our disc only includes Cycho Rider. The japanese Seiya Monogatari demo has been removed, so the discs directy boots into this nice little caravan shoot’em up. Also watch out for our little Cycho Rider contest starting today! UPDATE: Cycho Rider now is part of the Caravan Battle Stage boxset. It’s also available on its own, but it’s not longer bundled with Xak III and SO II.